The Ford Focus hit the streets in 1998 and represented the first car in a long line of future Fords that would drive better than any of its competition. The Ford Focus has enjoyed worldwide success, thanks mainly to its reliable handling. They have been described as one of the most reliable cars available, which makes buying a second-hand Ford Focus an easy decision. Ford is known for its excellence, so there is no wonder they have so many awards under their belts such as “Car of the Year” and “Most Popular Car” at the Honest John awards. Thanks to the number of different variations Ford has given us over the years, used Ford Focus’ are very affordable. The Ford Focus continually tops the UK’s sales charts and it’s not hard to see why. With incredible reliability, a competitive list price and all the tech you’ll ever need, a used Ford Focus is a no-brainer for the car-buying public. 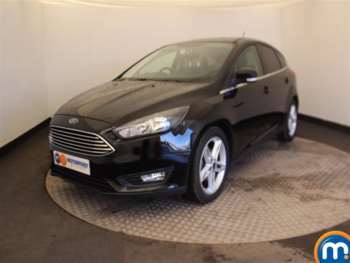 Whether you’re going for the Zetec model or Ghia, all Ford Focus models are well-equipped. The boot space is impressive, and the interior quality is excellent. The Ford Focus is a pure joy to drive. It has a fantastic rear-suspension set-up which keeps the Focus planted and competent around the bends. Plus, the driving position is spot on, meaning you’ll be pumping more adrenaline than your body can take. Performance is also impressive across the entire range. There is no shortage of the Ford Focus on the used car market, meaning you can take your pick of the range from RAC cars. Got a specific Ford Focus model in mind?